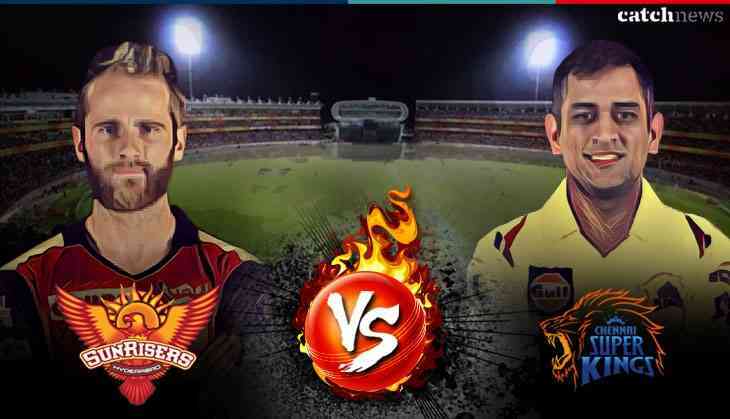 The 20th match of the blockbuster league IPL is going to happen in between Chennai Super Kings and Sunrisers Hyderabad. Both the teams have played 4 matches till in which both have won 3 matches. Now the race will be to get the momentum of winning the fourth match. One hand there is Sunrisers Hyderabad who had defeated other teams with their both bowling and batting strong power, however, in Gayle, they got a defeat from KXIP. On the other hand, MS Dhoni's team has proved their come back much stronger and they also have lost one match only till now and that too against Kings XI Punjab as Gayle performed quite well. If we see then besides Kings XI Punjab both the teams have managed to win their matches. However, now both teams are having problems as their star players like Shikhar Dhawan and Suresh Raina are out of their teams. However, if we see the history then in total 6 matches played between both the teams 4 games CSK won and 2 games SRH won. So the CSK team has put most of the pressure on Kings XI Punjab. If we discuss the squads of both the teams then the teams have that much power that can bring any match to their sides. MS Dhoni (C) (W), KM Asif Sam Billings Chaitanya Bishnoi Dwayne Bravo Deepak Chahar Faf du Plessis Harbhajan Singh Imran Tahir Ravindra Jadeja Kedar Jadhav Narayan Jagadeesan Kshitiz Sharma Monu Kumar Lungi Ngidi Suresh Raina Ambati Rayudu Mitchell Santner Kanishk Seth Karn Sharma Dhruv Shorey Shardul Thakur Murali Vijay Shane Watson David Willey Mark Wood. Kane Williamson (C), Tanmay Agarwal Khaleel Ahmed Basil Thampi Ricky Bhui Bipul Sharma Carlos Brathwaite Shikhar Dhawan Shreevats Goswami Alex Hales Mehdi Hasan Deepak Hooda Chris Jordan Siddarth Kaul Bhuvneshwar Kumar Mohammad Nabi T Natarajan Manish Pandey Yusuf Pathan Rashid Khan Sachin Baby Wriddhiman Saha (W) Sandeep Sharma Shakib Al Hasan Billy Stanlake. READ NEXT >> 'Namaste England' to release early!